Tahini, or sesame butter, is a paste made from ground sesame seeds. Tahini is often mixed with pureed chickpeas to make hummus. It’s packed with vitamins and minerals and can be used in a number of ways, one of which is blending in a smoothie. Tahini supports a healthy heart and immune system. It’s rich in the minerals calcium, phosphorus, lecithin, magnesium, potassium, and iron as well as vitamin E and several B vitamins. Tahini is also a good source of protein and contains more than most nuts. Combined with the other ingredients in this recipe and you have a bonafide superfood smoothie! Ana and I both made this with added protein courtesy of Sun Warrior. She described this smoothie as having strong flavors and I would have to agree with that assessment. Enjoy! Note, one cup of raw milk clocks in at 160 calories. If you’re concerned about this smoothie being too high in calories, substitute water, tea, or almond milk. 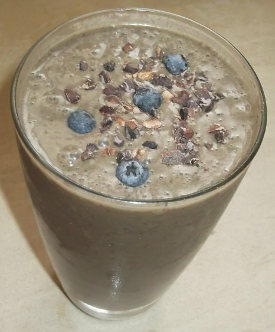 I’d love to know if you try this chocolate blueberry spirulina smoothie and how you liked it. Please leave a comment below. Happy Blending! This is absolutely delicious. Superfood heaven. Thank you for the brilliant recipe. My pleasure, Charlotte. Great to hear you enjoyed it!